What happens when an impromptu jam session between Elvis Presley, Jerry Lee Lewis, Carl Perkins and Johnny Cash breaks out on an unexpected evening in December? History. You get positively iconic, musical history. 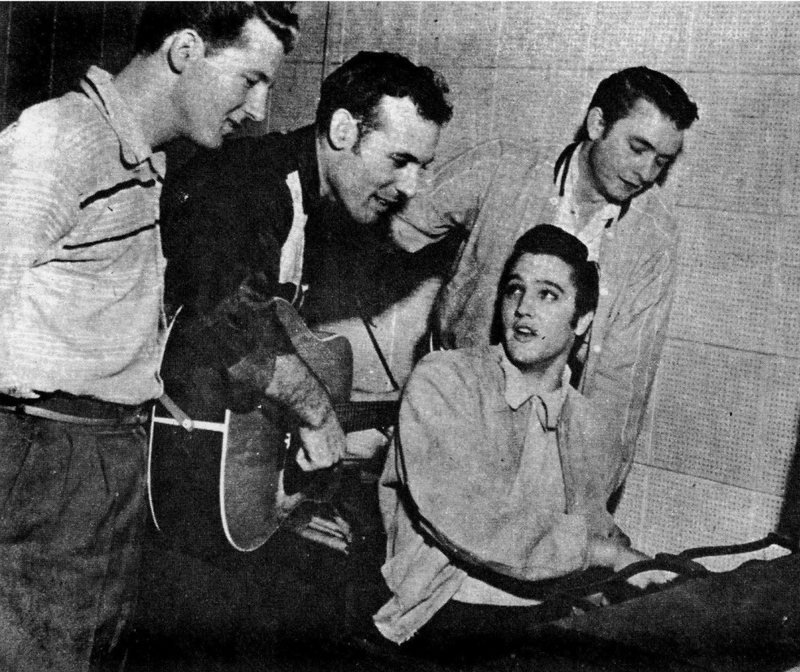 Elvis Presley, Jerry Lee Lewis, Carl Perkins and Johnny Cash of the original Million Dollar Quartet. Tomorrow marks the 59th anniversary of the night that these four music moguls of the ’50s all happened to pop into Sun Records studio. They originally meant to address their own agendas, but ended up recording some of the most precious tracks that are in our music archives today. 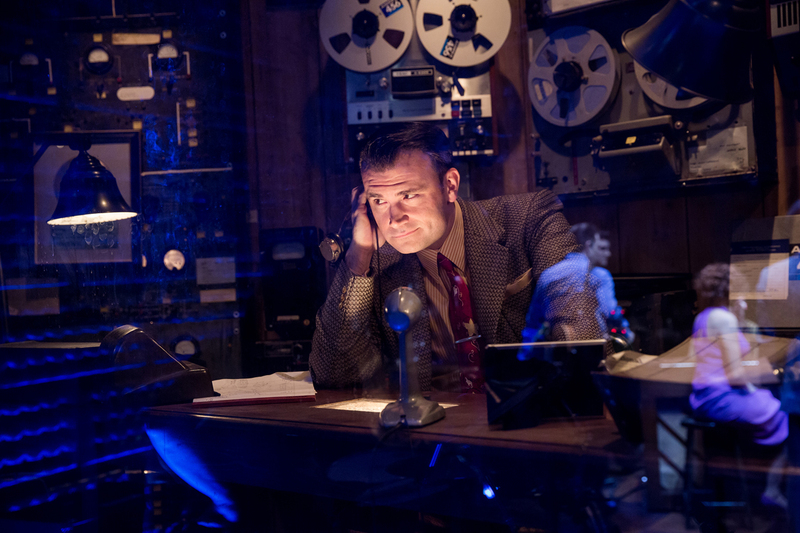 Referred to as the Million Dollar Quartet, the Vegas show of the same name pays homage to the happenings of this night and gives audiences an inside look at what really went down in that humble Memphis recording studio when musical magic was made. Bringing to life the fated December afternoon when Elvis Presley, Jerry Lee Lewis, Carl Perkins and Johnny Cash all came together for an impromptu jam session in Memphis’ Sun Records, “Million Dollar Quartet” gives audiences an intimate look into the musical process of the iconic musicians just as the original session’s recording reveals. Las Vegas cast member Robert Lyons made his Broadway debut starring as Carl Perkins — a role that he created — before moving his passion to the Entertainment Capital of the World for a cumulative total of six years as Carl Perkins in the rocking production. Considering that you have been in every production of “Million Dollar Quartet” since 2006, what has made you continue with this production and how do you keep your performing experience exciting for yourself and for the audience? It really doesn’t seem like it’s been that long since I started with “Million Dollar Quartet.” It’s a dream job and that’s why I’ve stayed. I don’t have any formal music or theater training, yet somehow I’ve been able to show up, rock out and have a few laughs on some of the world’s greatest stages. The best way for me to keep things exciting onstage is to stay present and in the moment. If I listen to my cast mates and stay focused on each moment as it unfolds, it’s easier to tell an honest story as opposed to simply waiting for my turn to speak. You obviously had to have studied Carl Perkins in order to portray his persona; what is a lesson that you have learned from the iconic musician through the years you have played him? The biggest lesson I have learned from Carl while portraying him is that often the biggest talents aren’t the most successful ones. He was such a great, well-rounded musician who wrote his own songs, played his own lead guitar and who went on to influence so many great musicians through his career. Surprisingly, he never really achieved the level of notoriety of many of his peers. 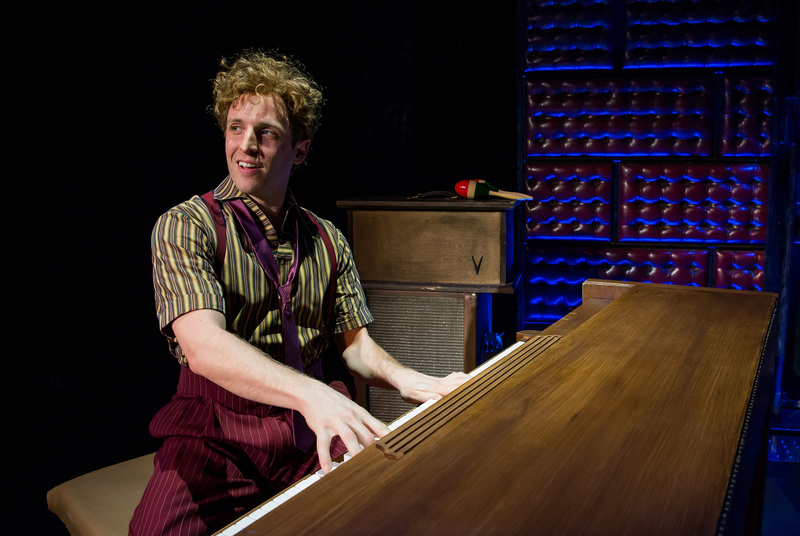 What has been the most rewarding part about being a “Million Dollar Quartet” cast member? I’m hard pressed to pick just one. An overarching theme is that I get to show up and play with my friends. We create and share art in real time on a daily basis. For me, it doesn’t get much better than that. How did you know that you perfected your Carl Perkins impersonation? I have not perfected a Carl Perkins “impersonation.” In fact, I don’t consider what I do to be an impersonation at all. What I’m trying to do up there is bring to life the spirit and energy of a great talent. If someone leaves the theater after seeing the show and does a bit of research on Carl, I’ve done my job. If you could ask Carl Perkins one question, what would you ask him and why? I’d ask him for some guitar lessons for obvious reasons. How did the original event of Elvis Presley, Johnny Cash, Jerry Lee Lewis and Carl Perkins happen? On the evening in question, Dec. 4, 1956, Carl was booked into Sun [Studio] to record a follow up to his hit, “Blue Suede Shoes.” Sam Phillips had hired an unknown piano player named Jerry Lee Lewis to fill out Carl’s sound. Both Elvis and Johnny Cash were back in town and Sam, being the opportunist that he was, made a few phone calls. Before long everyone was hanging out at the studio, playing music and catching up. Sam kept the tapes rolling and today we can go back and listen to that night. It’s an amazing glimpse into who these guys were and who they would eventually become. What made this moment in 1956 special enough to recreate in a production? It’s hard to imagine a better moment to recreate into a production. You’ve got these four giants of music who collectively have an enormous catalog of hit songs, hanging out in a recording studio at a time when their careers were really starting to take off. The idea behind the show is that the cast portraying these guys are also musicians in their own right, so the sense of realism is very high. Here we are in Sun Studios watching Elvis, Jerry Lee, Carl and Cash playing music, breaking guitar strings, and telling the stories of their connection to Sun Records as it was in 1956. It really is a magical thing. 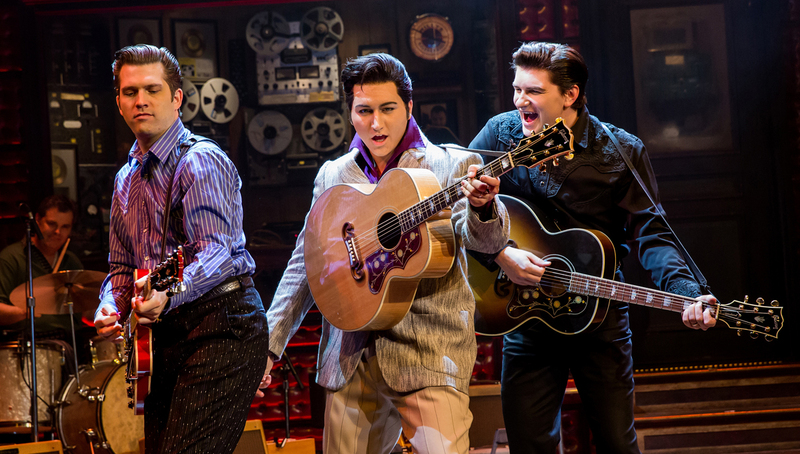 What do you think it is that has made the Vegas run of “Million Dollar Quartet” such a success? It would be easy to say that our success in Las Vegas is due to the fact that Elvis had such a connection with this town, but that would only be scratching the surface. Our production checks many of the boxes of what a hit Vegas show should be — a great story and great music performed with heart and passion by a talented cast. There are no gimmicks in our show, and at the end of the night, everyone in the audience is on their feet. 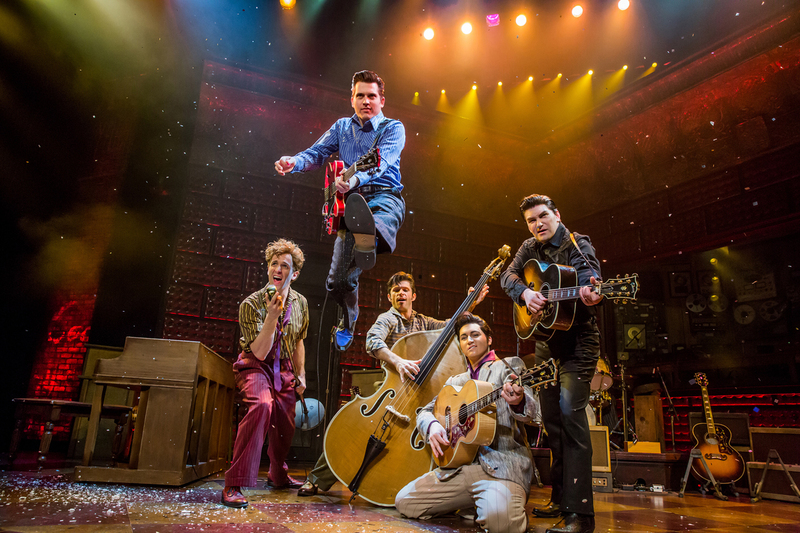 If an iconic “jam session” of four musicians were to take place today and be just as epic as the one depicted in “Million Dollar Quartet,” what artists do you think would be involved in the modern day million dollar quartet? I don’t think an impromptu jam session today could ever be as iconic as the Million Dollar Quartet was. That said, I’d pay good money to see Trent Reznor, Puddles the Clown, Björk, and Herbie Hancock play together. They are each so creative and musically adventurous that whatever they ended up playing would certainly be worth listening to. See Million Dollar Quartet perform Sunday – Friday at Harrah’s.